The Strength and Durability Of Metal Roofing Without the Boring Look! DECRA stone coated steel shingles are an excellent roofing material choice for the homeowner who is looking for the highest quality roofing products for their home. Developed initially during World War II the product has been refined and improved over several decades into the superior roofing product that it is today. 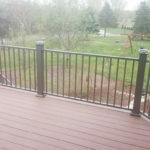 ThunderStruck Restorations is a full service home improvement contractor based out of Ham Lake, Minnesota and serving the surrounding area. We specialize in the installation of DECRA stone coated shingles on all types of residential properties throughout our Minnesota service area. If you are like most homeowners, you take a great deal of pride in the appearance of your home. The outside of your home is its first impression to friends, family, neighbors and, if you’re selling, a potential buyer as well. While landscaping your property and a coat of fresh paint can do a lot to improve the curb appeal of a home, one thing really leaves a more lasting impression: a new roof. Many homeowners choose an Asphalt shingle roof because it’s affordable and it’s what they already know but this is slowly changing. Metal Roofing is widely known as one of the most durable roofing materials on the market but with it’s high price comes a relatively boring selection of architectural appeal. The large flat panels of a metal roof don’t fit into everyone’s idea of a beautiful looking roof. This is where DECRA Stone Shingles come into play. For these reason mentioned above, and many others including roof aesthetics and appeal, more and more homeowners are choosing DECRA Stone Shingles for their home’s roof. How Much Does a DECRA Stone Shingle Roof Cost? This is a really hard number to give out over our website because it’s going to vary from house to house. What we can tell you is that the final cost will be in-between an asphalt roof and a traditional metal roof such as a standing seam metal roof. 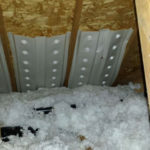 Does the old roofing material need to be torn off or are we installing overtop the existing materials? Does your roof have a safe, walk-able pitch or will we require scaffolding and additional safety equipment? Do you know what style of DECRA shingle you’d like installed? 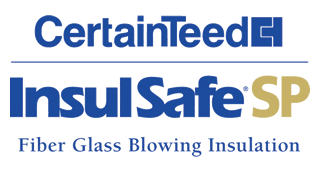 The best option is to request a no-obligation estimate from ThunderStruck Restorations. Our professional estimator will come out to your location to inspect your current roof and take accurate measurements and assessment of the work area. We’ll then be able to formulate an accurate cost to replace your shingles with DECRA stone shingles including tear-off (if required) and labor. With six distinctive profiles, a number of color options, and a large selection of concealed fastener systems, the DECRA Stone Shingle roof can be customized to any home. DECRA Tile®, offers the beauty and style of Mediterranean Tile and the lightweight components of stone coated steel. If this is the look you’re after it adds a unique elegance to any home. With a long-standing reputation for performance, longevity and versatility, DECRA® Tile is an ideal alternative to traditional tile roofing products. DECRA® Villa Tile combines the superior performance of steel with the classic beauty, elegance and architectural detail of an old world Italian tile. 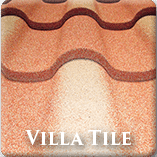 Durable and lightweight, Villa Tile requires little to no maintenance and can be walked on for maintenance purposes. 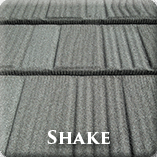 DECRA® Shake offers the distinctive beauty and richness of cedar shake, making DECRA Shake the ideal roof. It offers the distinctive beauty and richness of cedar shake, while providing the durability and longevity of stone coated steel. This superior product is available in a diverse range of colors guaranteed to complement any color scheme. DECRA® Shake XD®, emulating the classic beauty and architectural detail of a rustic, thick, handsplit wood shake, has a unique hidden fastening system and is installed direct to the deck. 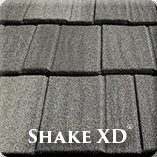 Shake XD® is the ideal roof, providing the durability and longevity of stone coated steel. 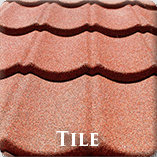 If you are looking for the upscale design of a dimensional shingle, DECRA Shingle is the choice for you. 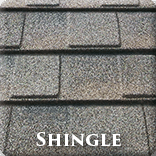 DECRA Shingle offers a classic look that features a traditional distinctive style, reinforced with the strength and longevity of steel. Available in a variety of natural earth tone colors, these colors incorporate a subtle natural shadow, which enhances the richness and detail of the roof. DECRA Shingle is pressure formed aluminum-zinc alloy coated steel with an acrylic bonded stone chip finish. The stone coating resists fading and UV penetration. 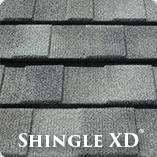 DECRA® Shingle XD® has the rich bold appearance of a heavy weight architectural shingle at a fraction of the weight. With its thick cut edges and deep distinctive shadow lines, DECRA® Shingle XD® provides greater dimensionality and a robust appearance. This profile adds wonderful appeal to traditionally styled homes and is ideal to those who prefer the look of heavy-cut wood shingles. A new steel roof makes a stunning impression, and can really transform the appearance of your house. The shingles are coated in stone granules and can be textured to appear as though they are other roofing materials like cedar shake or clay tile. This makes them incredibly versatile and appropriate for both modern and traditional homes. Your home’s curb appeal is more than shrubs and paint! A new DECRA Stone Shingle roof can transform an old, worn home into the envy of the neighbourhood. With unmatched longevity and durability, your roof will make a stunning impression for years to come. Who Installs DECRA Stone Shingles in Ham Lake Minnesota? 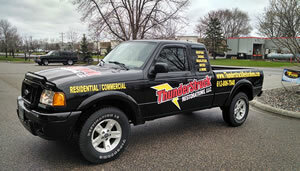 ThunderStruck Restorations is a home improvement contractor based out of Ham Lake, Minnesota. We specialize in the installation of DECRA Stone Shingle roofing systems for homes of all shapes and sizes. From your average single family sized one-level rancher to a townhome, duplex, or even a multi-million dollar estate home we’ll be able to offer a roofing solution. 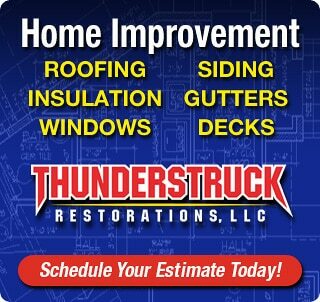 With unmatched knowledge on the various roofing systems, an expert team of installers, and pricing that can compete with any local contractor you’ll find you can’t go wrong letting ThunderStruck Restorations provide you with an estimate. Our goal is to leave no trace of our presence on your property aside from your meticulously installed new DECRA Stone Shingle roof.